For the second month in a row, DC managed to lock Marvel completely out of the Top 6 and steal the position of 'Publisher #1'. With a whopping 20.68% unit share lead, all DC's 52 rebooted titles finished inside the Top 100, with Men of War bottom of the stack at #87. Proving it's popularity is contagious, Penguin, Batman, The Huntress and The Shade also had mini-series' debut within the Top 100. The Diamond Comic Stats also show Marvel's top book was the relaunched Incredible Hulk (#7), while the biggest selling non-'Big Two' title went to Dark Horse, with Buffy The Vampire Slayer Season 9 Freefall #2 (#64). Image, was the third highest ranking publisher. 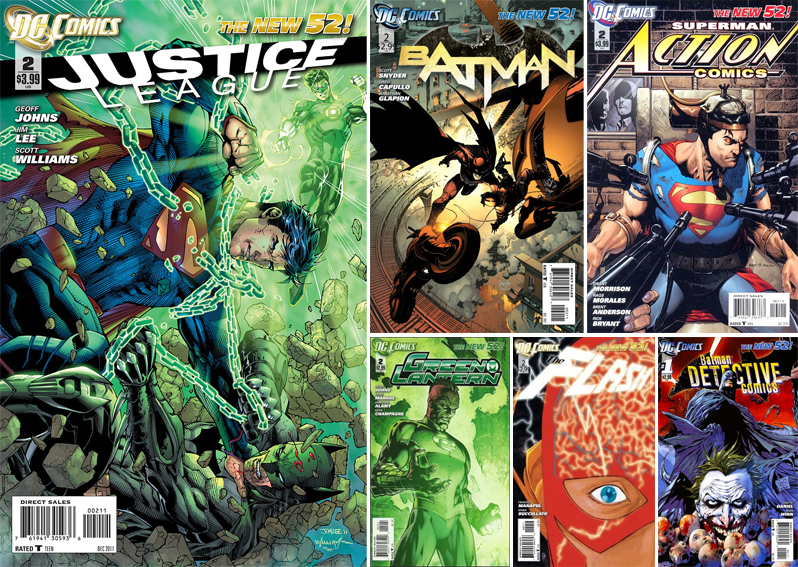 A massively positive event for comics, I ended up adding 21 of the DC 52 to my pull-list (only two of which are above). Based on the initial issues, I'll shortly sit down and cull the list back to a more manageable number, one mixed with my favourite titles from other publishers that will resemble 100% prime beef. As I'm pretty confident other folks will be making similar decisions soon, it will be interesting to see where these cut-backs leave DC's 52 results in the months ahead. I'm going from 48 titles in September, 39 in October and will probably hold steady at about 20 hear on out. Top 5 : Aquaman, Justice League, OMAC, Demon Knights, & Batman. Hey Joe - thanks for those great comments! Aquaman would definitely be in my top five as well, along with Stormwatch, Wonder Woman, Swamp Thing and Justice League - though that will probably change as soon as I hit send! Sigh - why does money have to be such a limited commodity! Huh. DC besting the House of Ideas hasn't happened since half past forever. Maybe this reboot thing isn't such a monumental cluster-f#$k after all? I've been following Action & Wonder Woman and so far they've been interesting reads. I know what you mean Pensol - DC had pretty much half the books sold that month - a few months ago that would've been a sign of the apocalypse.